Welcome to another round of the On Our Plates food photography blog circle! Be sure to follow the link at the end of this post to see what the other ladies have been cooking up this month. As you may have heard, we’ve had a little winter weather here in the south. A little over 2 weeks ago, southern Kentucky got a whopping 9 inches of snow in one day. It usually takes us at least a few years to rack up that many inches of snow, so needless to say, we were unprepared. It was days before our neighborhood roads were clear enough to drive on. While it was exciting & fun for the first few days, the fun wore off pretty quickly as the cabin fever set in. 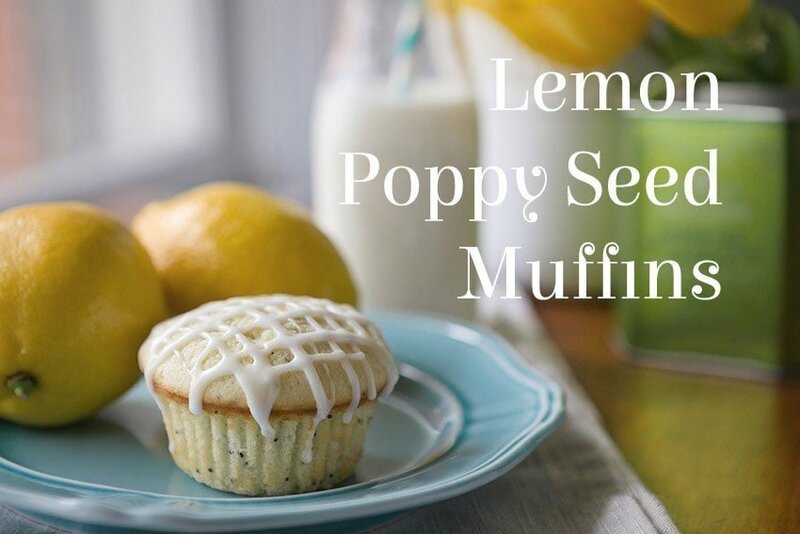 So as I sit here listening for the pouring rain to turn to sleet, then to snow, I am dreaming of spring with these Lemon Poppy Seed Muffins. 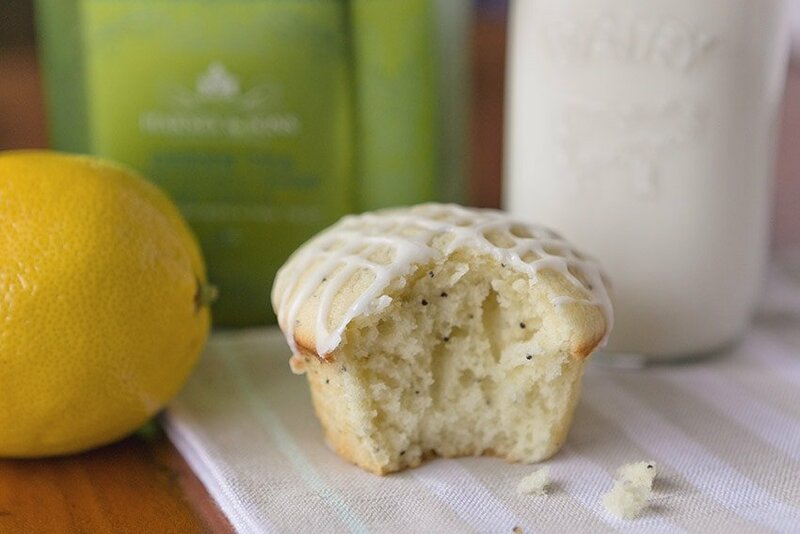 If you love Starbucks lemon loaf, you will love these muffins. This is a recipe from the Thibeault’s Table blog that I found on Pinterest (how did I ever find anything new to cook before Pinterest?) & have made several times with a few minor alterations. These are hands down my favorite muffins. The combination of lemon, yogurt, & buttermilk gives them a fresh, tangy flavor that is perfect when you are fighting the winter blahs. I’ve made them both with & without the glaze. I love them either way, but of course, the kids always prefer icing. I used my mom’s lemon pound cake glaze. It is nice & tart & perfect for these muffins. The recipe makes a dozen regular sized muffins, but they didn’t last long. The ballerina was itching to eat some muffins, but after watching me photographing them, she disappeared & showed up a few minutes later with her little pink camera. As soon as I finished & told her she could have some muffins now, she went to work setting up her own shots. I think she did a pretty good job with her food styling! Next up in this month’s circle is Emily’s Herb Tomato Bisque. Yum! That sounds perfect for this gloomy weather. Go see what she’s been cooking up & leave her some love. Thanks for stopping by! Whisk together dry ingredients & set aside. Mix yogurt, buttermilk, & lemon juice until smooth & set aside. 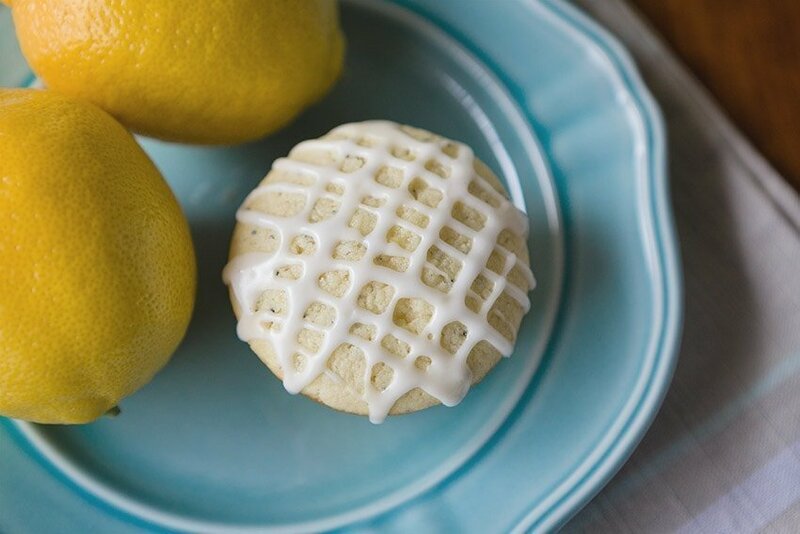 In an electric mixer, cream butter, sugar, & lemon zest until light & fluffy. Add eggs 1 at a time & beat until thoroughly combined. Add about a third of the flour mixture, followed by about half of the yogurt mixture. Alternate adding the rest, & mix until just blended. 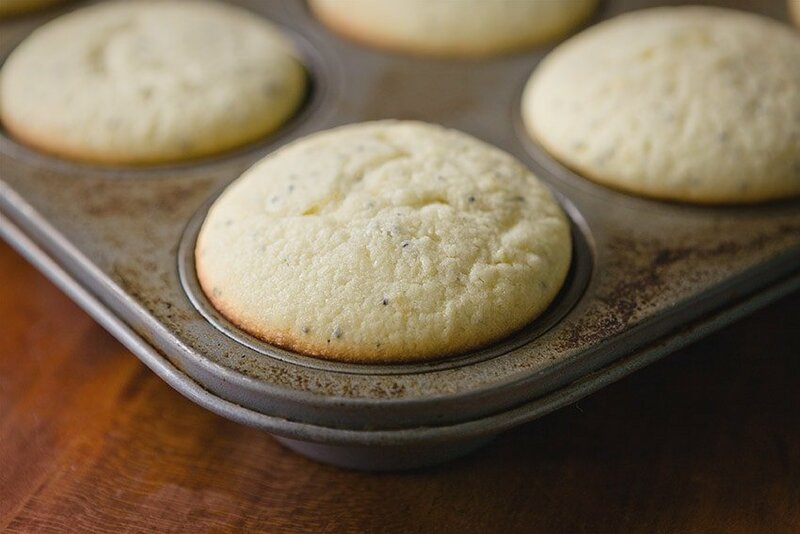 Stir in poppy seeds, then divide into muffin cups. Bake at 350° for about 20 minutes, or until a toothpick inserted into the center muffin comes out clean. These muffins come out a very pale golden color, so trust me & check them with a toothpick at 20 minutes, even if they don't look done, they probably are. I overcooked them the first time I made them, & it really makes a difference in how tender they are. While muffins cool, measure about a cup of powdered sugar into a mixing cup & add lemon juice, a tablespoon at a time. How much juice you add will depend on how thick you want your glaze to be. I kept mine fairly thick so I could drizzle it with a fork. If you want more glaze on your muffins, you could also make it a little thinner & dip the muffin tops directly into it. *I'm not going to go all food snob on you & say that only fresh, organic, locally harvested lemons will do. While I did use fresh lemon juice this time, I have made these with bottled lemon juice & they are really just as good. Just don't tell Martha I said that.